The Law Offices of Miller & Miller, P.C. supports many charitable causes each year. 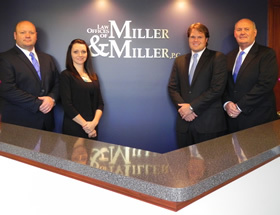 Below is a list of organizations that the Law Offices of Miller & Miller, P.C. have been involved in. ALLEN PARK BOOSTER CLUB - Adult booster club supporting Allen Park High School athletics. ALLEN PARK BULLDOGS - A youth organization for boys and girls, ages 8-13, providing a fun, knowledgeable and successful experience in their sport of football or cheerleading. AMERICAN LEGION - Chartered by Congress in 1919 as a patriotic, mutual-help, war-time veterans organization which now numbers nearly 3 million members -- men and women -- in nearly 150000 American Legion Posts worldwide. BILLY GRAHAM EVANGELICAL ASSOCIATION - BGEA exists to support and extend the evangelistic calling and ministries of Billy and Franklin Graham by proclaiming the Gospel of Jesus Christ to all we can by every effective means available and by equipping others to do the same. BUCKEYE CRUISE FOR CANCER - Cruise with the stars for cancer research in memory of Stephanie Spielman. CHRISTIAN LEGAL SOCIETY - CLS is a non-denominational Christian membership association of lawyers, judges, law professors, law students, and participate in the broad and rich variety of Christian congregational life and traditions. COMPASSION INTERNATIONAL - A Christian child advocacy ministry that releases children from spiritual, social, and physical poverty and enables them to become responsible, fulfilled Christian adults. DETROIT RESCUE MISSION MINISTRIES - A Christian faith-based charitable organization, accredited by the Commission Facilities (CARF). DRMM is dedicated to meeting the basic needs of humanity, while motivating individuals to rebuild their lives. DISABLED AMERICAN VETERANS - An organization of disabled American veterans building better lives for Americas disables American veterans. DOWNRIVER COMMUNITY CONFERENCE - Provides leadership in establishing common, positive goals and economic assets of the Downriver area; enhance the quality of life for area residents, workers and businesses; regional, county and local levels; and identify, obtain and responsibly manage the necessary financial resources. FISH AND LOAVES - Our mission is to unite churches, concerned civic groups, the private sector, and individual men and women of faith in a community partnership to ensure that no one goes hungry or without adequate nutrition in Downriver. FRATERNAL BLUE LINE - An organization that strives to insure that law enforcement professionals are honored, remembered, and respected publicly. HENRY FORD HOSPITAL VATTIKUTI UROLOGY INSTITUTE - A clinical and research center for urological care. MICHIGAN WILDCATS - A travel youth baseball team for ages 10 years and under for southern Wayne County, MI. NORTHRIDGE CHURCH - At NorthRidge Church, our purpose is to lead people to a life of faith in Christ and then on the journey to devotion. PELOTONIA - A grass roots bike tour with one goal, to end cancer. SALVATION ARMY - “Doing the Most Good” is the motto of the Salvation Army. An international movement is an evangelical part of the Universal Christian Church. It’s message is based on the Bible, it’s ministry is motivated by the love of God. It’s mission is to preach the Gospel of Jesus Christ and to meet the needs in His name without discrimination. SAMARITAN’S PURSE - International Christian relief and evangelism organization, provides spiritual and physical aid to victims of war, poverty, natural disaster and disease. SECOND AND SEVEN - A non-profit organization that helps promote literacy throughout central Ohio and beyond. YMCA - Helping individuals afford programs such as summer camp and sports programs for the kids social interaction for adults and seniors, and more.